Juvederm is an injectable gel that is a naturally occurring substance in your skin. It instantly restores skin’s volume and smooths away facial wrinkles and folds, providing a youthful, natural look and feel. 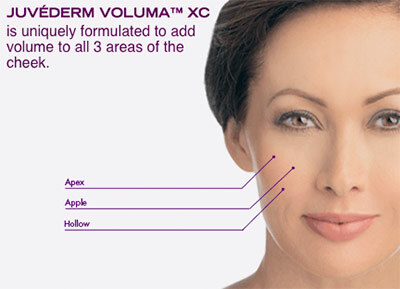 What Is Juvederm™ Injectable Gel? Juvéderm™ is a smooth consistency gel made of hyaluronic acid—a naturally occurring substance in your skin that helps to add volume and hydration. Your healthcare professional eases Juvéderm™ injectable gel under the skin to instantly restore your skin’s volume and smooth away facial wrinkles and folds, like your “smile lines” or “parentheses” (nasolabial folds—the creases that run from the bottom of your nose to the corners of your mouth). Almost 90% of all study volunteers who were treated with both Juvéderm™ injectable gel and another dermal filler† preferred Juvéderm™! 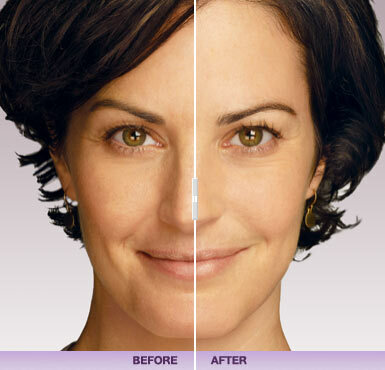 With Juvéderm™ the injection process takes only about 15 minutes and results are immediate. Plus, there’s minimal recovery or downtime. So you can step into your doctor’s office for treatment and step right back into your life. Juvéderm™ Ultra and Juvéderm™ Ultra Plus are indicated for injection into the mid to deep dermis for correction of moderate to severe facial wrinkles and folds (such as nasolabial folds). Side effects were usually mild to moderate lasting 7 days or less and included temporary injection site reactions like redness, pain, firmness, swelling and bumps. For more information, please click on the “About Safety” link, or call the Allergan Product Support line at 1-877-345-5372. • Visit the official Juvederm Website. • See BEFORE and AFTER pictures at the official Juvederm Photo Gallery. • Click here to read important Juvederm Safety Information.